If you recently lost one or more teeth, our dentists may recommend dental implants. A dental implant is a titanium rod our dentists surgically insert into the jawbone. Over several months, the implant fuses with your jaw and acts much like a natural tooth root would to later support a crown. If you've ever felt self-conscious about missing teeth, you owe it to yourself to schedule a consultation with one of our dental implant dentists today. 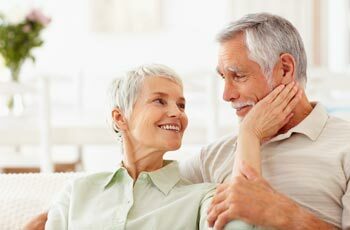 Continue reading to learn the top 3 reasons patients choose dental implants. For more information, feel free to call our dentist office to schedule your appointment. We look forward to hearing from you. After tooth extraction, our dentists will recommend an implant to help you maintain good oral health. Otherwise, your lower jaw will start to deteriorate and eventually alter the shape of your face. The best time to get a tooth implant is immediately after extraction. Your teeth are held in place by roots and adjacent teeth. This means that when you lose a tooth, nearby teeth are likely to tilt toward the open space, loosen, and eventually fall out. Fortunately, dental implants support nearby teeth so you can continue smiling with confidence. Dentures sit on top of the gums and don't prevent jawbone deterioration. A tooth implant, on the other hand, will exert pressure your lower jawbone needs to stay healthy. If you don't get a tooth implant, you will eventually lose jawbone tissue and experience facial collapse. Once the jawbone deteriorates, it'll become harder to refit dentures so you can chew without pain. Unlike dentures, dental implants never slip. This means that you can eat, talk, and smile like you did before tooth loss. While denture teeth have to be submerged in water or denture cleanser when they aren't in your mouth, implants can be cared for like natural teeth. Like the name suggests, a dental bridge “bridges” the gap left by a missing tooth. A bridge is comprised of an artificial tooth anchored by crowns on healthy adjacent teeth. In order to place a dental bridge, our dentists would have to remove healthy enamel from teeth on both sides of the gap. Once enamel is removed, it can never be replaced. Our dentists prefer implants over bridges because they let you keep as much natural tooth enamel as possible. A tooth implant is sturdier than a bridge because it's anchored to your jaw. This added stability helps you smile, talk, and eat with confidence. Dental implants are also long-lasting, which means you'll be able to enjoy a beautiful healthy smile for years to come. Our dentists will be more than happy to help you explore your tooth replacement options, which include dental implants. To schedule your appointment with one of our Grandville dentists, call (616) 534-0080.